Sharing a meal with your bird can be a wonderful bonding experience, but did you know that it can also benefit your pet's health? Many bird diets lack certain vitamins and minerals that birds need, which can lead to a host of serious health conditions. Feeding your bird a healthy diet does not have to be costly or time-consuming. 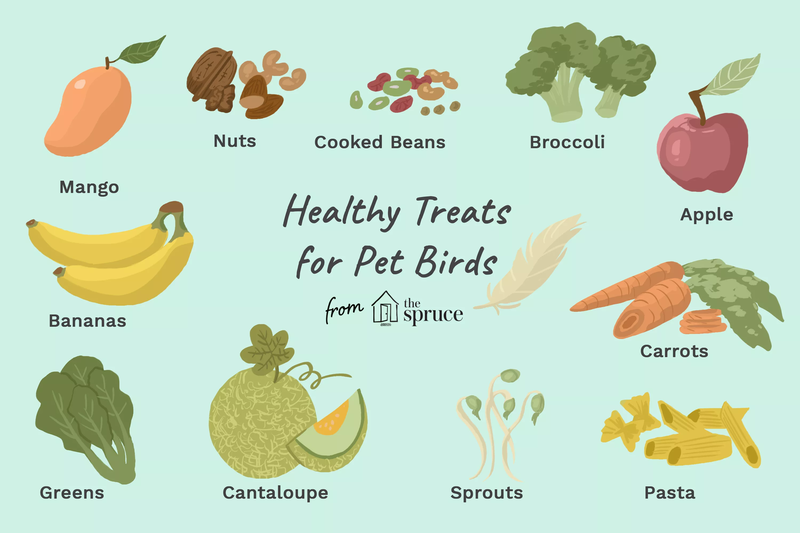 When you feel like your bird deserves a special treat, try serving up one of these healthy and easy options that are packed with taste as well as beneficial nutrients. Mango, pomegranate, bananas, cantaloupe or apples, it's your choice, and it's also about what your birds prefer. Just about any fruit imaginable is good for your bird's diet. Full of taste and nutritional value, fruit is a wonderful source of vitamins, and these choices are a favorite among the vast majority of pet birds. As with any fresh food you offer your bird, remove and discard any leftovers a couple of hours after serving. This prevents bacteria growth inside of your pet's cage. Take it easy on the grapes, however. They contain a lot of sugar. Do you like alfalfa sprouts on your salad? Your bird will like them too! Learning to safely sprout in your kitchen is not difficult at all! Be sure to thoroughly wash any sprouts that you offer your bird. Some may have come into contact with pesticides in their journey from the garden to your local supermarket, and you don't want to pass these toxins on to your pet. Growing your own sprouts is a healthy way to give live, raw nutrition to your flock. Wild birds feast on an amazing variety of vegetables in their natural habitats, so it only makes sense that fresh veggies are good for companion birds as well. Try offering your pet some thoroughly washed and rinsed broccoli, cauliflower, or greens next time you serve these veggies in your home. Other avian favorites include carrots, kale, root vegetables, and peas. No matter whether it's cooked or uncooked, birds love pasta. The good thing is, it's full of energy enhancing carbohydrates! Try boiling some bowtie pasta with vegetables and serving it to your bird when cool. If your pet prefers his pasta crunchy, fill a few raw macaroni noodles with a nut butter for a fun and tasty snack. Whole grain bread tastes great and is a wonderful source of fiber. Try offering your pet small bites of bread as a treat for good behavior. Serving breakfast toasts offers a nice changeup to their morning meal.